New Hope for Children Orphanage: Six children who wait for sponsors: will you rescue one child? 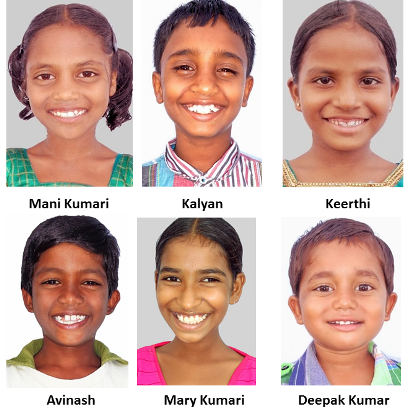 Six children who wait for sponsors: will you rescue one child? Mani Kumari: Father died, mother unable to care for her. Used to beg for food & clothing. 8 years old and in 2nd grade at Rajoli Orphanage. Wishes to become doctor. Kalyan: Age 10. Father disabled, mother alcoholic. Abandoned at age 3. Lived with uncle but uncle's wife tortured him. Wants to be a doctor. Lives at Rajoli home. Keerthi: Keerthi is in 1st grade. Parents were not able to provide for her. Has new hope at our home in Rajoli, India. Avinash: His father is pastor serving in remote village where there is no school. Little income. 8 years old in 2nd grade. He wants to be a pastor. At Rajoli Home. Mary Kumari: 7 years old, 1st grade at Rajoli. Lost father, mother mentally ill. Begged for food. Enjoys studies and wants to be teacher. Deepak Kumar: Father is pastor serving in remote area. Little income. 4 years old. At Rajoli Home. Most of the children are orphans or street children who have no family to care for them.